I get bike started and ride home about ten minutes. Park. Next day go to start bike. No power. Smh look down and notice my harness from ignition and start stop switch are melted and grounded out... uh o... well it’s early spring and I had just put new tires on and recovered my saddle.... so I’m thinking I’ll band aid this and just re solder ... pull everything off start soldering then decide, maybe cheap is not the way to go... So I order an aftermarket ignition (still being cheap... fu*%&$) And put it and a used switch back on. 1.What might I have f’d up either by using a boost box to jump? 3. Other than main fuse any other fuses or electrical components I should test first? Thanks for any insight. Much appreciated! What is the state of your Battery? Remove the battery charge it (if possible) and have it load tested, it may have developed an internal short. 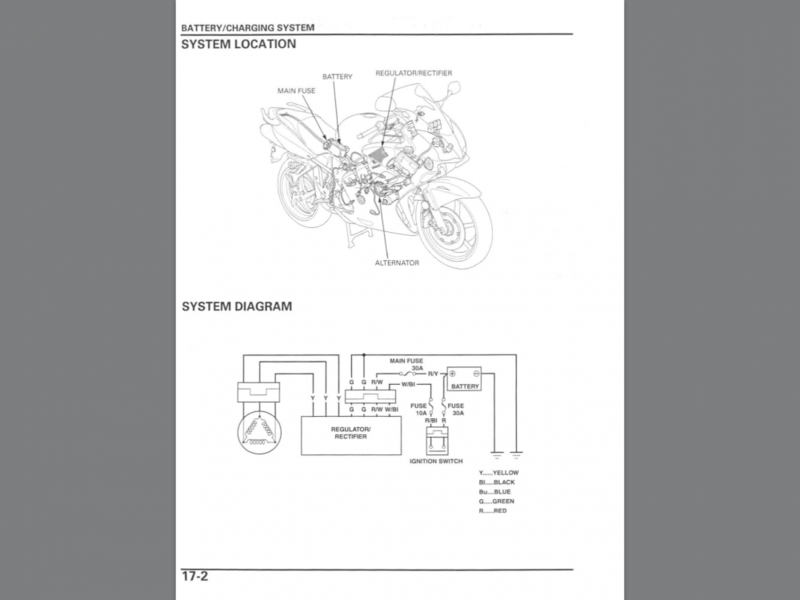 Is your bikes wiring stock standard? Have you confirmed that both A and B 30amp fuses are OK? These should have blown to protect the wiring of your ignition switch etc. Do you have the Service Manual? It can be downloaded from the home page. Unplug your Alternator output lead from the R/R (3 yellow wires) make sure there are NO short to ground. Your R/R may also be in a sorry state! Your initial connection of the "Jump Box" was that correct polarity???? You may have cooked your charging system. Good Luck - Sounds like you're going to need some! Thanks I really appreciate your input, yes I’m hoping for best but preparing for worst... This helps me with things to check... I’ll post when I get it sorted. I’m pretty sure the massive amperage output of the jump box toasted your wire harness. The wire to the ignition switch is not fuse-protected and always hot, from the battery. When you turn the key on, that triggers a relay, which powers up the fuse block and the rest of the bike, which are all fuse-protected. Your best bet is to pull the entire harness out of the bike and completely strip it, to assess damage. With any luck, it won’t have melted a bunch of wires together and you can simply repair what you need to. Worst case is you have to find a complete harness and swap it in. Keep in mind, the battery in your bike is less than 200CCA. A vehicle can require upwards of 700CCA. If that jumper box can overcome the dead battery in something that can require three times the cranking amps of your bike and can still start that vehicle, you shouldn’t use it. I’ve completely stripped my harness, due to previous stator and R/R issues. It’s not that bad, once you get it out of the bike. Sorry Ducnut, I beg to differ. We are talking about a 2002 6gen. The circuit diagram I have shows No such relay controlled by the Ignition Switch to power the fuse box! The Ignition Switch supplies power directly to the Fuse Box. The main RED wire to the Ignition Switch is most definitely protected by Main Fuse A 30amp. All electrical wiring services from the battery are at least protected by 30a fuses A and B. And the sub fuses. Provided there are No unprotected wiring shorts then adding a 12v Boost battery in parrellel should not cause an issue in starting the bike. 12v is 12v, current draw is set by the resistance of all the loads. Absolutely correct. There is no way to cram more current through a circuit without changing the voltage applied or resistance of the circuit. CCA is just a measure of current capability, not the amount of current that is delivered. It wasn't a 24V jump box, was it? The problem here sounds like a resistive short (like corrosion bridging two terminals) in the ignition switch. The ignition switch is protected by a 30A fuse, however you can do a lot of damage before that fuse blows. Imagine if you have 20A flowing through the ignition switch through a ~1.5 ohm load on a 14V circuit for hours. The ignition switch is not designed to dissipate that kind of power and would predictably melt. Agree with you MadScientist. This is a very unusual situation described by the OP and I'm suspicious of possibly non standard wiring. A protective fuse should have blown in his situation before melting wires if the wiring is stock standard. A lot of people believe that fuses are there to protect the devices, this is not correct, fuses are there to protect the wiring. More details have been requested but no answer as yet, doesn't help in trying to diagnose his issue! !